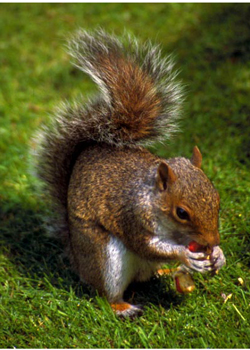 Squirrels are very much like human beings: they have no natural weapons and must use their wits to protect themselves. The first zikzi or brown squirrel (what we call a "red squirrel") was originally living in the form of a man. This man was in possession of certain powerful items that allowed him to hunt bears. He had a little white bear who could command bears to submit to the hunt, and a gourd which, when rattled, would cause the bear to die his tracks. One day Henu, who along with his elder brother was starving, came out looking for game. In the distance he could hear a man shouting for bears. He cut off the bear, then helped the man prepare it for roasting. Just the same, the man gave him only a mouthful of intestines and the feet of the kill, keeping all the rest for himself. In retribution for his sins, Henu's brother pursued him with a red horn made of wood and in the end turned him into a brown squirrel. This is why to this day the brown squirrel is condemned to be pursued by boys with red horns (arrows).1 It is the arrow that really separates humanity from squirrels. In another story, Squirrel shares in the warrior prowess of his brothers Porcupine and Turtle when he borrows some of the quills of the former to use as arrows. This enables them to defeat a warparty of Bear Spirits who came to rub them out.2 It is of course the bow and arrow that allows an animal as powerless as a man or a squirrel to fell the most powerful of all predators in North America, the bear. Because of its lightning reflexes and great speed in the trees, the squirrel may be one of the most difficult animals to hit with an arrow. The spirit being, Wears White Feather on his Head, once came upon a group of people trying to shoot a squirrel fleeing through the trees. Not one of them could hit the squirrel, but Wears White Feather got him with his first arrow, causing a good deal of resentment.3 On another occasion Wears White Feather engaged the Giants in a race. They insisted that he lay in a tree that they had bent over, and when he did so, they catapulted him to the opposite end of the earth, where he became stuck in a giant red oak. In the second race, they did the same thing to him, but this time he turned into a squirrel and ran right down the tree. Wears White Feather is also known as "Wears Sparrows for a Coat" because he has a coat made of living sparrows.4 His simultaneous affinity for squirrels and sparrows suggests that sparrows are the squirrels among birds, and squirrels the sparrows among mammals. Links: Bear Spirits, Turtle, Wears Sparrows for a Coat, Bird Spirits, Gourd Rattles. Stories: mentioning squirrels: mentioning squirrels: The Brown Squirrel, Old Man and Wears White Feather, Wears White Feather on His Head, The Animal Spirit Aids of the Medicine Rite, Porcupine and His Brothers, The Arrows of the Medicine Rite Men, Trickster and the Eagle; mentioning porcupines: Turtle's Warparty, Porcupine and His Brothers. Themes: four brothers, Turtle, Porcupine, Squirrel, and Little Red Turtle, live together and go to war together: Turtle's Warparty, Porcupine and His Brothers. 1 Paul Radin, "The Squirrel," Winnebago Notebooks (Philadelphia: American Philosophical Society) #21: 1 - 85. 3 Paul Radin, "Wears White Feather on His Head," Winnebago Notebooks (Philadelphia: American Philosophical Society) #4: 1-50. 4 Paul Radin, "Old Man and His Grandfather," Winnebago Notebooks (Philadelphia: American Philosophical Society) Notebook #53, 1-107.